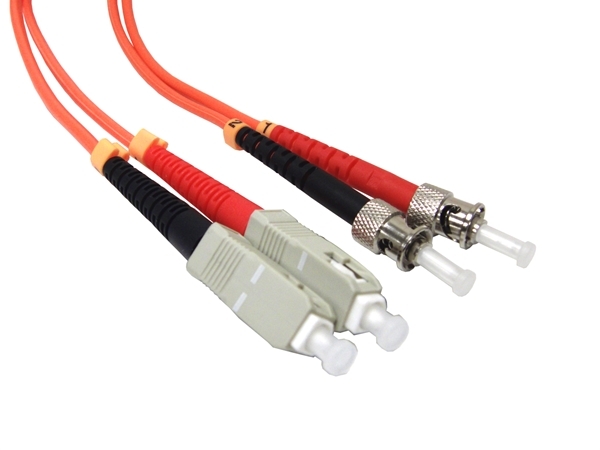 These multimode 62.5/125µm duplex fiber optic patch cables are terminated with ST fiber optic connectors on one end and SC fiber optic connectors on the other end (SC-ST). Straight Tip ("ST") connectors utilize a bayonet-style coupling type, enabling a simple twist-on and twist-off installation. Referred to as Subscriber Connectors, Square Connectors or Standard Connectors, these push-pull connectors are the most common choice for FTTH (fiber to the home) applications in use for Datacom and Telcom; most GBIC modules also require this connector type.